Alex Kapranos and Bob Hardy came to Milan for a promo day in late November 2017, and we were honoured to meet them in person. Their answer showcase the creative urgency and the passion that still drive their work after many years. Alex: I do! We played in Milan and Bologna. I remember Bologna, the venue used to be a squat in the past, I loved that place and its history, and we played in a very warm and sweaty room, I have very good memories of that gig. I remember I was amazed to be in Italy and play those shows, and how intense the audience was. I also remember the gig in Milan because there was a big fight outside the club, the club was at low level and very spread out, and the fight was afterwards, a guy got stabbed and he was walking around and all of his blood was on our shirts, it reminded me a bit of a Saturday night in Glasgow. I remember the gig as well, those gigs really stay with you. Can you tell something in general about those months when you tored small clubs, which is something that never happened afterwards, as you almost immediately started to play in big venues? Alex: small clubs were a short period of time for this band, but I spent ten years touring small and even smaller clubs with other bands, so it wasn’t new for me. I loved those gigs, we do love playing small gigs every now and again, we did one in Paris recently. It’s exciting when you first start, because it’s supposed to be your first time, so every single gig is special. I remember them vividly and, as I said, they stay with you. Now we can talk about the new album, first of all I would like to ask you if you want to tell me something about this thought I had. 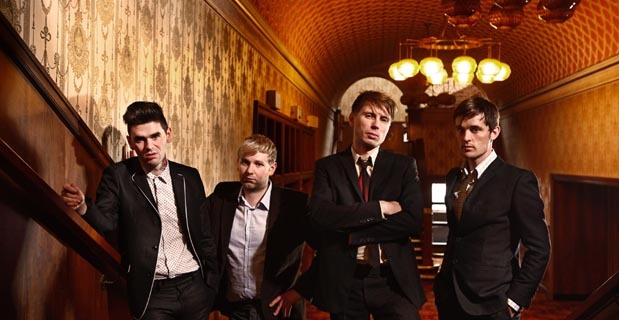 I think you may or may not like Franz Ferdinand, but you can’t debate that in every album the band tried to do something different and, at the same time, after just a couple of seconds, every listener realizes it’s Franz Ferdinand. Alex: that’s really what we’re in for as a band, but particularly now. We are in a new decade, so it’s not just the difference between albums, but also between eras for the band, like the end of a chapter and the beginning of a new one. It’s a completely new decade for the band’s existence, and, because the line up changed a little bit, it allowed us to re-address what we’re doing and say “OK, where are we going now? What can we do this new?”. But still, keep our DNA the same, keep our identity the same. I noticed something new in the songwriting for this album, you always made some songs verse-chorus-verse, and some other ones that are a different thing. I think in this album you did many more different things than in the previous albums, and thgere are some songs that are very, very far away from the verse-chorus-verse scheme, especially “Lois Lane” is very unconventional. Bob: as a music fan, that’s my favorite kind of song to listen to. I think that part of the reason that came up on this album is that we gave ourselves a lot of time to come up with ideas and put them in, for some songs we had so many melodies and parts, lots of ideas, they were Frankenstein kind of songs, and part of that was because of the space and the time we gave ourselves to write. Alex: it all starts with ideas, you don’t do something new because you’re using an instrument you never used before, I think a lot of bands make this mistake, it has to start with ideas on what you wanna sing about, what you’re gonna do, the way you want to make people feel, what you’ve already done before, so structures, yeah, I like songs structures, I loved, when I was younger, songs like “Oh Well” by Fleetwood Mac, “Breakfast Time” by Orange Juice, “Live And Let Die”, Paul McCartney is a master of unconventional songs, songs that, by the time they’re finished, you forgot how they begun, because it’s completely different. I love that stuff. Talking about the sound, I noticed that it’s not something new for you, because you already used some electronics in the past, but I think it has a much bigger role on this album. Alex: I think there’s always been synthesizers or keyboards, since our very first single “Darts Of Pleasure”, but you’re right, the sound is different on this one. I think we always wanted to be a band that makes dance music, and play it live as a rock n roll band, and I think this album is the culmination of that principle, we took it way further than we ever did before. I was on a radio station the other day, they played “Always Ascending” and “Love Illumination” back to back, and “Love Illumination” sounds great, but also more like a rock band, while this record, I don’t exactly know what it is, and that’s great. My biggest regret is that we never came up with a name for this genre, we may call it “natural futurism”, it sounds like what we wanted to do, music played by humans, but looking to the future. I would love to come up with a name for this gerne, because, at the end of the day, you’re locked into genres, maybe instead of “natural futurism” we may call it “future naturalism”. I’d like to ask you about the rhythm, I think it’s particularly different from the past, maybe it’s related to this intention to sound more dancey. Bob: when we were writing, we were using sequences, drums and bass parts, and write them on a computer or some other kind of device, and then bring them into a live band, play them live, and you end up writing things you wouldn’t naturally do if you just go with those instruments in a live setting, because, when you’re using a diferent interface, things change. I think this was something very effective for us. I like harmonies on “The Academy Awards”, I think it’s quite possible to relate it to “Eleanor Put Your Boots On”, and I really like how you do this kind of harmonies, but you do it very rarely. Alex: I’ve always loved harmonies and to get them together. There’s a few ones in “The Dark Of The Matinée”, and there are some few more examples of it. It didn’t really happen so much in the past, because Paul and Nick should have sung them, and Paul did some little singing in a band in the past, while Nick never sang before, and I think they found the idea of too many harmonies a little terrifying, so they just would sing the same line I was singing. So, we just kept it really simple, but now Julian is in the band, and he can do harmonies literally with his eyes closed, and he’s got very different voice from me, he’s got a really high pure voice, and the combination of our two voices brings a real richness, and it goes well with Paul’s and Dino’s vocals live. Songs like “Always Ascending”, we play it live with a four piece harmony, we’ve never done this before live, and it’s really cool. Have you got a procedure to make a song, is there a songwriting session, you jam in the studio, how does it happen? Alex: for this record, there’s a different methodology for almost every song. Different starting points, different methods, “Always Ascending” started with the musical idea of a chord progression that never resolves, “Lois Lane” started of creating two fictional characters. Bob: I think every album had different starting points. If we talk about lyrics, do you think it’s possible to sum up some general concepts fro your lyrics, or do you think that each one has its own kind of identity? Now, of course, everyone is waiting for your live shows with great expectations, considering you line up change and the sound expansion. Alex: well, we already played quite a lot this year, we did an American tour, European festivals, it’s been really good. It’s good to have harmonies on stage, extra musicians, Dino’s on guitar and Julian goes between keys and guitars. The older material sounds fresher and the new stuff is really exciting for us. There’s also a great camaraderie in the band, and we’re enjoying socializing with people after the shows. How many new songs did you play? Alex: in September we started with four, and the last few dates we played eight. They were tiny gigs, but I think that now, if you want to hear the songs, they’re out. Bob: there are fans with bootleg versions of the new songs we played. Why do you never play “Darts Of Pleasure” live? Alex: we play it! That first gig in Bologna, we definitely played “Darts Of Pleasure”, I remember it, it was the last song in the set. Alex: we played it a few times, I’m pretty sure we played it in a show near Florence, because someboby in the crowd requested it and we played it. So, next time you come see us play, come to the front and shout it! Alex: some songs, you play them once in a lifetime, some other ones you play more often.